I have such fond memories of Riverside. My mom took me there when I was a kid, it was one of the first dates I had with my wife, more good stuff like that, but yesterday did have me pondering the existence of modern amusement parks, as least ones branded with the supposed six flags of fun. Oh sure, we had a good time on the rides, usually after waiting excessively long times to get on them anyway. I get it, six flags runs 30 safety checks to keep themselves lawsuit free, but do I need to wait 40 minutes to ride a 90 second roller coaster? If the park was full that would be one thing, but it really wasn't that busy. I think one of the tricks is that they only have one car on the tracks now, where as back in the day they would have one car on the tracks while the next one was loading. And the seats, oh the tiny little padded seats. I'm an averaged sized being but the whole day I felt like every ride was designed for people 12 and under (unless I wanted a ride to go upside down anyway). Again, we did have fun yesterday, but in the six hours at the park, I think we rode maybe 10 rides, that's it. Maybe I'm just remembering Riverside more accommodating that it actually was. Oh well, at least lunch should be cheap.... or not. I guess I shouldn't be surprised by a place that charges $38 for anyone over 2 years old to go into a park. I wound up splitting an $11 cheeseburger with my daughter because I just couldn't bring myself to buy two. Granted, it came with about a pound of very tasty curly fries, but $11? Really? That doesn't even include the $4 for a drink (or $3 for a bottle of water). That's not all because I had to work way too hard to find that burger. Every place was pizza or chicken strips, chicken strips or pizza. What's up with that? We kept walking by the food stands, hoping to hit Johnny Rockets because they must have burgers... nope, they've been replaced by a much more generic place - that doesn't have burgers. Had my daughter not been paying attention to the little place behind us, we would have starved to death apparently.... actually I was about two seconds from getting ice cream for lunch, but we found the burgers, and saved the ice cream for later. Part of me is debating picking on the employee who made these, but the other part of me wants to say that at least she tried since I'm guessing it was the razzle machine causing most of the trouble. She started off with a healthy heaping of Oreo bits, some softserve, and then mixed it up. She then added softserve two or 3 more times blending after each turn, and even then they weren't really that well blended (I had to manually blend it to really get the flavors mixed up). 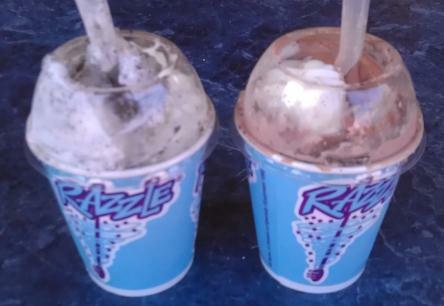 Oh well, the razzles still got the job done, but the vanilla base was pretty terrible (and bright white). Oh, and if you are curious, they all come in M&M flavor and they will set you back $5.49 + tax. Buy Again? Do I have a choice?